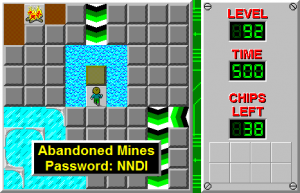 Abandoned Mines - The Chip's Challenge Wiki - The Chip's Challenge Database that anyone can edit! 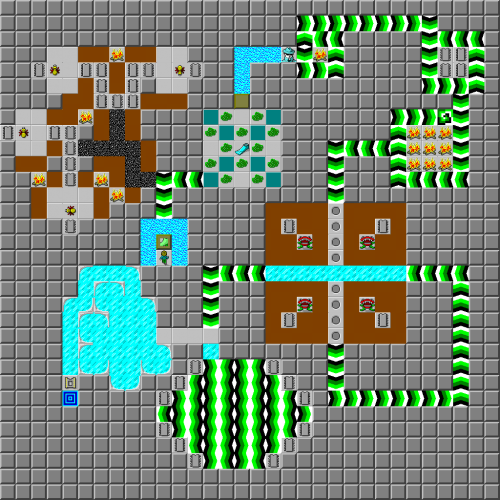 Abandoned Mines is the 92nd level in Chip's Challenge Level Pack 2. This level is quite easy to complete if Chip simply sits around and waits for the obstacles, or walks around the teeth; the hard part, of course, is scoring high. Odd step is required for this route. Clear out the first blue wall on the right, and then steal the chips from the bugs in a general clockwise direction: start with three in the chain of five, then the one to the south, the one to the west, the one to the north, then the first six in the chain of nine, the chip on the right, and finally the other three. Now, try to steal the flippers, and now prance LULU 2R U, which will hopefully allow Chip to sneak through the blobs. Strategies for this section can include spring steps when heading towards the flippers if both sides hold blobs, and also by removing blue wall 5 on the way to the flippers. This can allow further space for some of the blobs to move, decreasing the chance that blobs will collide and thereby increasing the chance that one will run into Chip. Follow the force floors, move up over the first west force floor, take the four chips, and continue moving through the maze. To make this section slightly easier, move L and >[D 2R] D off the last chip instead of the rapid-fire 2D boost, as Chip can stand the loss of  due to an upcoming teeth section. Take the first chip on the left, waste the spare move if Chip hasn't yet, and then collect the other three chips east, south, and west. Move D, then  for the released teeth and slide through the force floors, which just sneaks past the teeth as they charge northwards. Now, Chip will move into a section with opposing force floors against each other. This is by far the hardest part of quick Abandoned Mines play; it is not solvable in Lynx, as Chip cannot go backwards over force floors even when using other force floors. Off the ice space, the correct route through is L 3R 2D >1 R 2D LDUL 2D >1 R 3L 2U >1 L 2U RUDR 2U >1 U, and then slide to the exit. This page was last edited on 7 April 2019, at 01:50.